← WWJD (What Would Jack Bauer Do)? Why do they design bus seats like this? People don’t want to face each other at that proximity and risk making eye contact, much less accidentally touch knees. The woman in the pink shoes isn’t putting her feet there because she’s rude. She’s doing it because there’s barely any place else to put her feet. Can you imagine four people (in bulky winter clothes – this is Canada) crammed into that space? Surely, bus design people, you can’t be saving so much space with this configuration that it justifies this. Taking public transportation is a social nightmare to begin with. There’s no need to make it worse by forcing people to invade each others’ personal spaces. 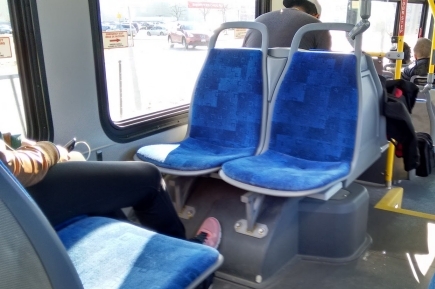 This entry was posted in Life and tagged crappy design, public transport, rant, social anxiety. Bookmark the permalink.